80 pages, 6" x 9"
Kaya Oakes' work has appeared in Conduit, Volt, MiPoesias, Coconut, Shampoo, and many other journals. 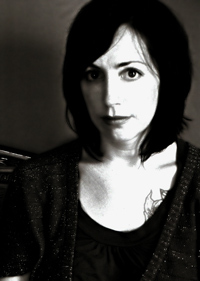 The recipient of awards and grants from the Academy of American Poets and the Bay Area Writing Project, she is also the senior editor of Kitchen Sink Magazine, and she teaches writing at the University of California, Berkeley. 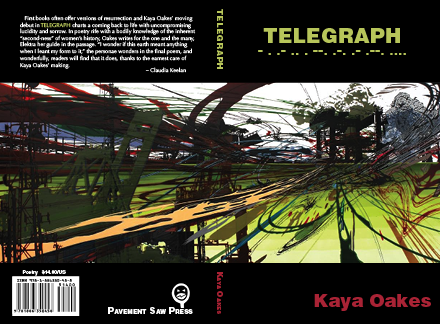 "First books often offer versions of resurrection and Kaya Oakes' moving debut in TELEGRAPH charts a coming back to life with uncompromising lucidity and sorrow. In poetry rife with a bodily knowledge of the inherent “second-ness” of women’s history, Oakes writes for the one and the many, Elektra her guide in the passage. “I wonder if this earth meant anything when I leant my form to it,” the personae wonders in the final poem, and wonderfully, readers will find that it does, thanks to the earnest care of Kaya Oakes' making." You ought to have gone with her, years ago. and wrapping up your fingers with them, like a tourniquet. nail scissors in half-drunk bathrooms where she doesn’t live. While shots go off outside, the scissors scrape and pull. She climbs the stairs climbed so many times before. or failing at his work and practicing his oaths. of the door that yields to business.